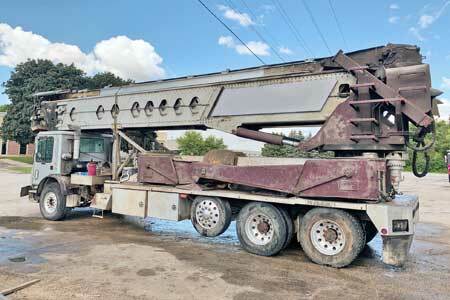 2005 Putzmeister Telebelt TB-130 Reduced $20K! 2000 Putzmeister Telebelt TB-105 Bargain! 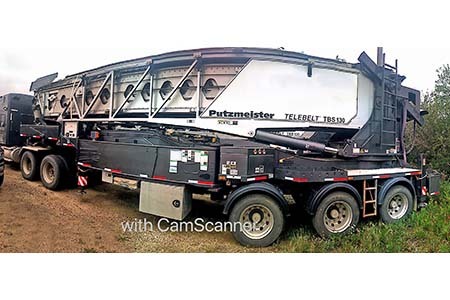 1999 Putzmeister Telebelt TB-105 Refurbished! 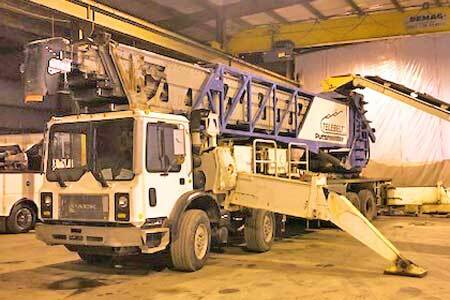 Putzmeister Telebelts are truck-mounted telescopic conveyors that place concrete, aggregate, sand, stone, gravel and earth backfill. 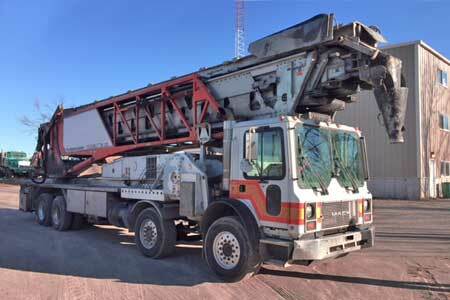 Telebelts are extremely versatile, rotating telescopic conveyor systems that can handle concrete, fill and aggregate. 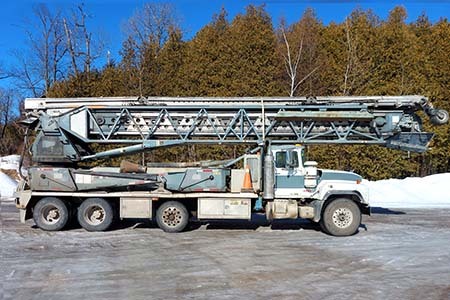 They are typically truck-mounted but trailer and lattice tower-mounted versions are also available for special applications. 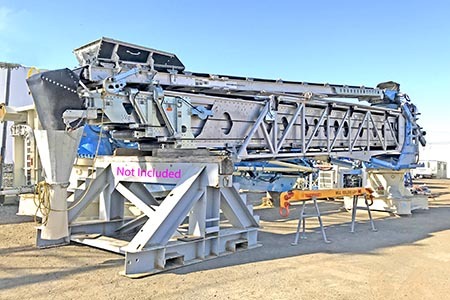 Telebelts employ two conveyor belts - the Feeder Belt, which is hopper-loaded, extends to the ground and discharges material onto the Main-Belt which in turn, places the material. They are also capable of "reverse-placement" because they can be used to remove material - even from otherwise inaccessible places! 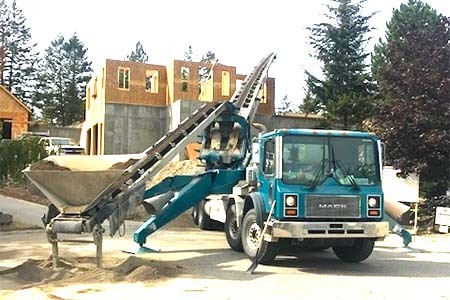 Telebelt conveyors can accurately place materials in low-clearance situations and through wall openings like no other equipment because of their telescopic design. They are tremendous time and labor-saving devices! 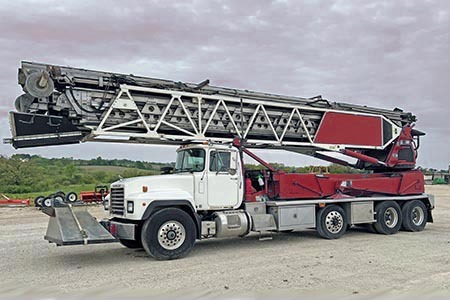 Putzmeister offers Telebelts in several models with 80-200 feet in horizontal reach, belt widths from 18 to 24-inches and capacities from 360-600 cubic yards and hour. 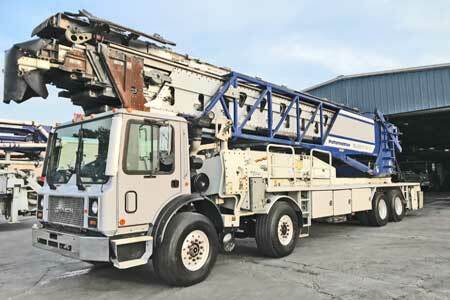 They handle 4-6 inch aggregate/rock. 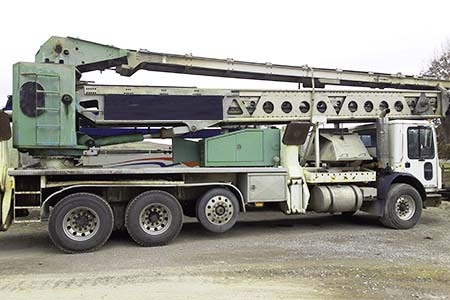 The TB-80 is the smallest in the line of truck-mounted conveyors. 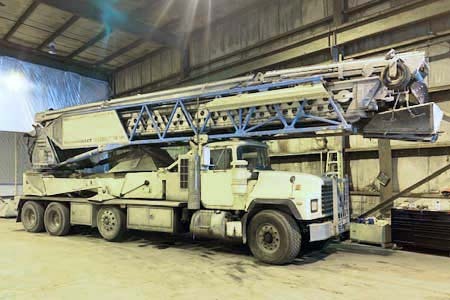 Its three-section boom has a horizontal reach of 80-feet and a discharge height at 30-degrees of over 46-feet. At 0-degrees (flat), it produces 360yds./hour and can handle up to 4-inch rock on its 18-inch belts. It has a rated capacity at 20-degrees of 230yds./hour. 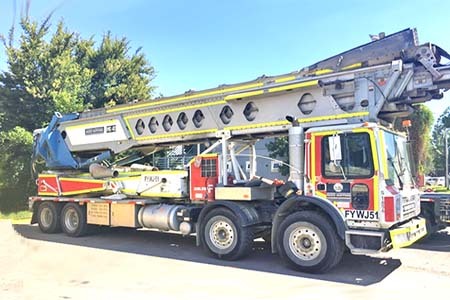 This smaller, lighter and least expensive model is often used on residential and minor commercial projects but is also ideal on any job where limited space may preclude a larger unit. 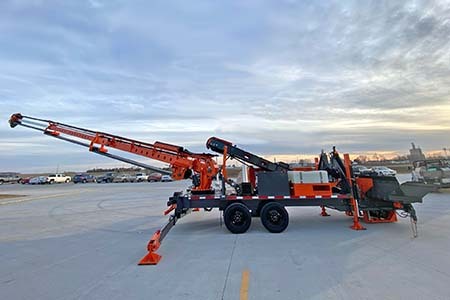 It can set-up and work at a height of less than 15-feet. 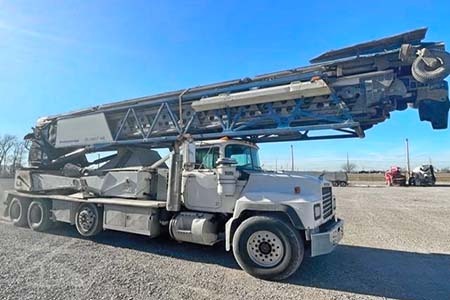 The TB-110 is a larger, truck-mounted, 4-section boom conveyor with 106-feet of horizontal reach and a discharge height at 30-degress of 62-feet. It produces up to 360yds./hour at 0-degrees (flat) and 230yds./hour at 20-degrees and can handle up to 4-inch rock on its 18-inch belts. 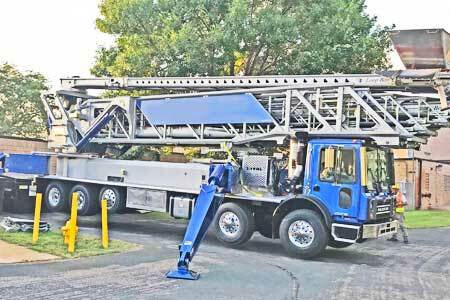 Despite its size, this model can set up and work at heights under 16-feet. 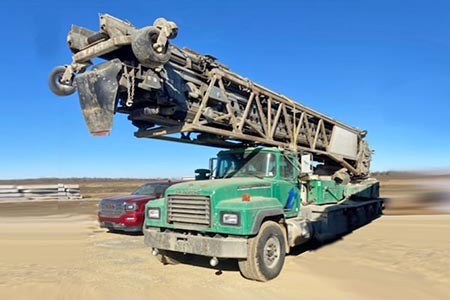 The TB-130 is a very large, truck-mounted, 5-section boom conveyor with 126-feet of horizontal reach and a discharge height at 30-degress of 68-feet. Like the smaller models, It also produces up to 360yds./hour at 0-degrees (flat) and 230yds./hour at 20-degrees and can handle up to 4-inch rock on its 18-inch belts. This model can handle concrete slumps from 0" to 12" and features a patented "quick set-up" outrigger design. Remarkably, this larger model can also set up and work at heights under 16-feet. 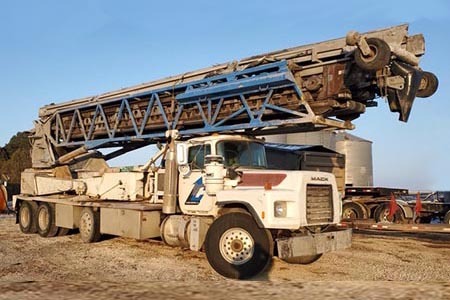 The TB-600 is the largest and highest capacity, conventional truck-mounted Telebelt conveyor with a 6-section boom having 106-feet of horizontal reach and a discharge height at 29-degress of 55-feet. With its 24-inch belts, it produces up to 600yds./hour at 0-degrees (flat) and 378yds./hour at 20-degrees and can handle up to 6-inch rock. 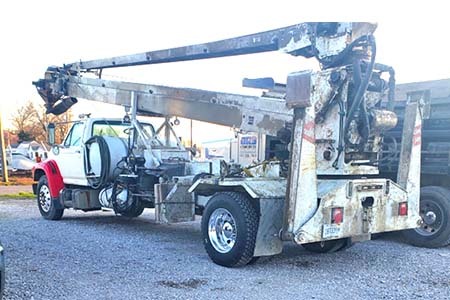 This model can handle concrete slumps from 0" to 12" and features a patented "quick set-up" outrigger design. Remarkably, this larger model can also set up and work at heights under 16-feet. 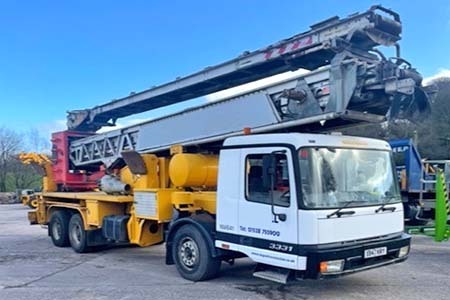 Designed for large civil projects, the TB-600 offers the greatest versatility in material type and volume and will place the heaviest, flowable materials. 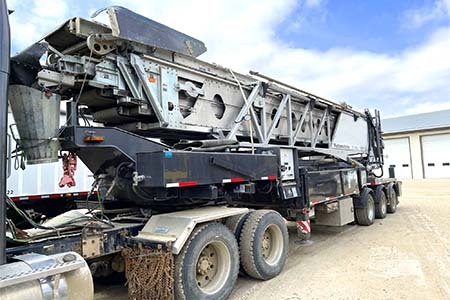 The TBS-600 has the same specs as the TB-600 but is a semi-trailer mounted alternative that offers several advantages including greater mobility, a tighter turning radius and reduced axle loads. 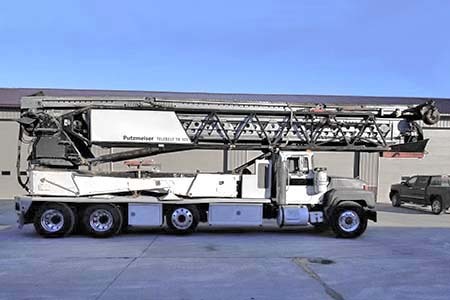 The TB-200 is Putzmeister's longest-reach and largest mobile telescopic conveyor, mounted on a super-duty, low-profile, "crane carrier" truck. 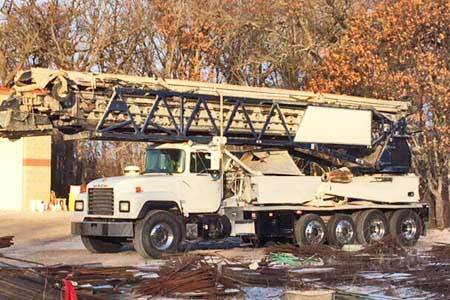 With its 4-section boom, it has 200-feet of horizontal reach and a discharge height at 30-degress of 114-feet. 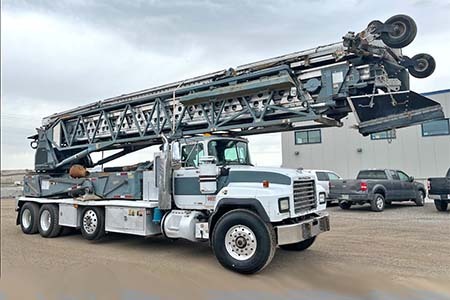 This model produces up to 300yds./hour at 0-degrees (flat) and 180yds./hour at 20-degrees and can handle up to 6-inch rock on its 24-inch belts. 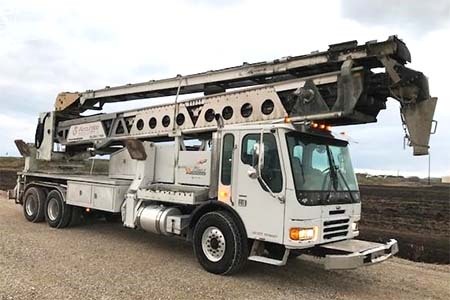 This advanced design offers numerous special features and benefits including increased working range, superior maneuverability, lower counterweight requirements, more power options and fewer wear-parts. The TB-50, TB-80 and TB-105 are legacy products, no longer in current production. TELEBELT is a registered trademark of Putzmeister America, Inc. Equa Corporation has no affiliation or sponsorship with Putzmeister America, Inc.